In a runoff election this Sunday, Jair Bolsonaro, a former army captain and congressman, won the presidency in Brazil by a margin of 55.1 percent to 44.9 percent, defeating Fernando Haddad, a son of Lebanese immigrants, former Mayor of São Paulo, and former Minister of Education. Haddad ran for the Partido dos Trabalhadores (Workers Party) or PT, which had led Brazil’s government from 2003 to 2016. All told, more than 114 million Brazilians cast their ballots, with 57.7 million favoring Balsonaro and 47 million favoring Haddad. On the surface, Bolsonaro’s victory might appear to be an ordinary vote by the world’s fourth most populous electoral democracy. But that would be a gross misreading of the situation. 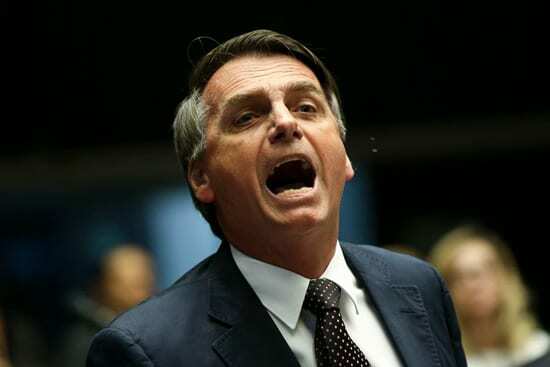 As Ernesto Londoño and Shasta Darlington write in the New York Times, “The president-elect, Jair Balsonaro, has exalted the country’s military dictatorship, advocated torture and threatened to destroy, jail or drive into exile his political opponents.” Moreover, Bolsonaro’s victory is not an isolated event. It is, rather, the latest in a series of steps that have eroded Brazil’s institutions, similar to what we’ve seen in Poland recently. It would be difficult to find a government that has not engaged in creative accounting, but in the face of her widespread unpopularity stemming from an economic recession, this was enough for Brazil’s lower house to impeach Rousseff, after which the upper house removed her from office. Then, a year later, Rousseff’s predecessor Luiz Ignacio “Lula” de Silva was found guilty of accepting a seaside apartment as a bribe; for this offence, he has been sentenced to 12 years in jail and banned from competing in the 2018 election. As with Rousseff, though, the charges against Lula were hardly airtight. As Mark Weisbrot, codirector of the Center for Economic and Policy Research (CEPR), a nonprofit advocacy group, said in a New York Times op-ed, “The bribe alleged to have been received by Mr. da Silva is an apartment owned by [the construction company]. But there is no documentary evidence that either Mr. da Silva or his wife ever received title to, rented or even stayed in the apartment, nor that they tried to accept this gift.” It is widely believed that if Lula had been allowed to run for president this year, he would have won, and quite possibly by a sizeable margin. In office, Lula’s “Bolsa Familia” and related programs had helped reduce inequality that had been among the world’s worst—so bad that Brazilian had once been widely known as Belindia because the south was as wealthy as Belgium while the northeast was as poor as India before its recent tech-fueled economic growth. The regional disparity persists, but the gap under Lula was getting smaller, as Brazil’s northeast enjoyed rapid economic growth. Writing in NACLA, Gianpaolo Baiocchi and Marcelo Silva note that many gains made in Brazil over the past two decades—“Bolsa Família, the cash transfer program, affirmative action policies, and the expansion of access to education, construction of housing for the poor, improved access to basic healthcare”—are now under threat. Bolsonaro, they note, has also pledged to “reduce social spending and all manner of “pity policies” for “northeasterners, gays, blacks, and women,” as well as weakening worker rights and privatizing state companies. These claims may sound familiar to worried US voters, and indeed, the growing prominence of far-right, nationalist movements across the globe has emboldened individual leaders to make statements that might have been considered unthinkable ten years ago. More broadly, Baiocchi and Silva note that Brazilian democracy is itself at risk. Were Brazilian democracy to collapse entirely, it would not be the first time. This is what happened in 1930, and then again in 1964. The first time, it took 16 years until the return of democracy; the second, 21…with hobbled institutions, weakened political parties, and only the thinnest veneer of protections for the most vulnerable and for dissent, we must remember that Brazil’s democracy, however imperfect, had accomplishments worth defending.